Instrument Processing | Design Ergonomics Inc.
As practices increase in their productive capacity, it is common to see problems develop in the sterilization and instrument processing area. Many practices notice an increase in staff discord as this growth occurs. Insinuations that one staff member is not pulling his or her weight, and a belief that the practice does not have enough instruments are common symptoms of this problem. These stresses are indications of poor organization in the sterilization area. Symptoms include grumbling between staff members about sterilization responsibilities and a backlog of instruments to be processed. If your practice seems to have some of the recurrent symptoms of an inadequate instrument processing system, perhaps it is time to evaluate your process. Need to purchase additional hand instruments in the absence of substantial practice growth. The need for full or part-time sterilization staff in any practice. Inter-staff discord regarding sterilization duties. In a slow practice, time is available for staff members to process instruments inefficiently during gaps in a loosely scheduled day, during cancellations and before and after the doctor is at the practice. When doctors improve their office scheduling, one result is staff complaints regarding sterilization. Unfortunately, in order to remedy this situation, we find that most doctors’ response is an attempt simply to speed up their existing system rather than improving the system itself. This is analogous to trying to motorize a slide rule, rather than adopting computerization. 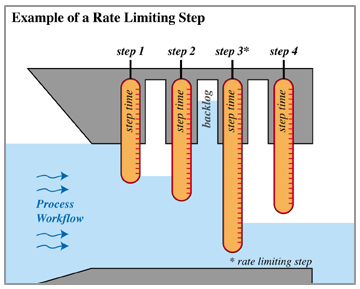 FIGURE 1: The rate limiting step determines the flow rate of any process. Increases in speed alone are a recipe for failure because of the principal of rate limiting steps (fig.1), which states that an entire process will move no faster than its slowest step. Efforts to speed up the process will fail unless the entire process is accelerated in a balanced manner. Examples of failure abound. Many doctors have attempted to speed up the process by purchasing a small capacity, high-speed sterilizer. Contrary to popular belief, this will not speed up overall instrument processing. Having emergency need for such a unit only points out overall system weakness and lack of balance in the sterilization sequence. The only way that low capacity units, such as this, increase overall efficiency is through the use of full-time sterilization staff, a concept that had many proponents five or so years ago, but which does not and will not make clinical or economic sense. Another proposed remedy for sterilization bottlenecks is the all-in-one stericenter, with its complicated – have to go to school to figure it out – system. Sterilization is best when the system is easy. Speed, simplicity and reliability are the keys to successful sterilization. You do not need to spend twenty thousand dollars in order to obtain optimized sterilization! FIGURE 2: A whole office cassette system markedly increases office performance. The first step in successful sterilization is simplification of the instrument deployment system. For this, if you have not already done so, it is strongly recommended that you convert completely to a cassette system. (see fig.2) Success in conversion to cassettes hinges upon two essential elements. First, the establishment of a small number of common setups – for example, operative (including crown and bridge), endodontics, oral surgery, examination and hygiene. Do not maintain a myriad of setups! 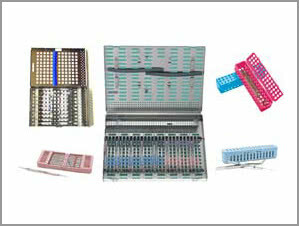 Schemes that were devised to simplify tray setup called for a broad array of different tray types, each with a limited number of instruments. These compact instrument arrays were planned as a way to make individual tray setup less time consuming. With cassettes, you are freed from constantly organizing instruments; therefore having a greater number of instruments available for a given procedure is simply a convenience. This allows a single set up to handle a wide range of services. It will decrease set up time and will allow greater flexibility in cassette use (for example – our office can easily complete a post and core using only our endodontic cassette; an exam cassette can accommodate a simple filling or an orthodontic ligature change and an operative cassette will accommodate any restoration). When instruments are processed in cassettes, you eliminate handling throughout the contaminated portion of the processing cycle. The success of this strategy depends upon two preconditions. One, cements and resin must be removed at chairside. This is necessary in any event. No instrument processing technology will remove today’s cements when they are allowed to set on your equipment. Two, instruments should not be allowed to fully dry prior to processing. A processing pre-soak as instruments wait for processing delays is imperative. Now that you have streamlined your transport system, the sterilization sequence itself becomes simpler and far more productive. Presoaking is an important, but often overlooked, element in the sterilization sequence. Presoaking markedly increases the effectiveness of subsequent steps. Presoaking will never be lauded by our dental equipment and supply dealers as it costs pennies and requires no expensive instrumentation. Simply dedicate an appropriately sized sink or basin for soaking and place your cassettes in a diluted enzymatic or caustic solution. As the successive portions of the sterilization process become ready for action, you are able to transfer cassettes out of the rinse and into the instrument wash. Should you desire to treat certain instruments, for example orthodontic pliers or handpiece burs (fig. 3), with dry heat, these can be segregated early in the sequence. A ëmilk bath’ pretreatment is an alternative pretreatment option that may be desirable for the carbide tips of such components. FIGURE 3: Bur cassettes allow carbide instruments to be processed by dry heat if desired. Instrument washing is the next step in the processing sequence. Automating this with a dishwasher (see fig. 4) is a simple, logical method. Contrary to popular belief, most offices do not need a high cost, high-speed unit. In order to understand this, you may have to reach back to chemistry class and the concept of rate limiting steps. Basically, a process will run no faster than its slowest step will permit. Don’t buy an expensive high-speed washer until you have decided on an autoclave – both with regard to cycle time and capacity. FIGURE 4: Dental use of instrument washers has grown significantly in recent years. With instruments successfully washed, moving on to actual sterilization is a simple task. However, there are many misconceptions. First, size matters. You’ve got to be able to fit multiple full-sized cassettes in your autoclave or you are wasting your time. Too many offices have full-time sterilization staff simply because they are too cheap to throw out a working, but inadequate, autoclave. Big is better because a unit that handles seven or more cassettes slowly is much faster than a high-speed processor doing one cassette at a time. Batch processing is also much more labor efficient. If desired, cassettes dry upon removal from the washer are now wrapped or bagged for autoclaving. This step is not without some controversy. The issue concerns the need for wrapping in private practice. Wrapping instruments does decrease sterilization efficiency; however, the wrapped cassette is then protected from potential airborne contaminates post processing. 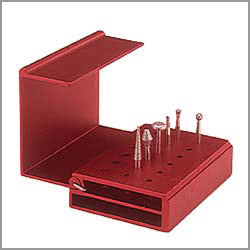 However, when this is compared to the typical tray setup or drawer storage, it is common to find offices that set out instruments by hand on open trays once autoclaved. As many doctors argue, even storage of unwrapped cassettes in a clean storage cabinet is a significant improvement over the protection offered with tray setup*. Once you have reorganized your system in order to permit efficient workflow, you will find that the sterilization constraints that you have been experiencing simply fade away. This will allow for significant practice growth. None-the-less, after significant growth has occurred, you may find that you wish to further speed up the system. The way to do this is simply by reducing the time for each step. Fortunately, this has become possible recently due to the advent of new high speed, high capacity autoclaves. At the beginning of this article, we briefly discussed rate limiting steps. Historically in sterilization, the rate limiting step has been actual disinfection. This is because spore kills are time dependent. While this remains true today, that time has been markedly reduced by the chamber preheat capabilities of newer autoclaves. The first significant reduction in autoclave processing time came with the introduction of the SciCan Statim, by using a small chamber volume – a single cassette. Recently, units such as the Tuttnauer 2540 EHS or the Barnstead PV Dry have been introduced, which both increase speed and have adequate chamber volume. Each of these autoclaves has the combined advantages of room for multiple cassettes and rapid pre-heating, similar to, but not as quick as the popular Statim units. The large capacity of these full sized autoclaves more than compensates for the modest reduction in cycle time. 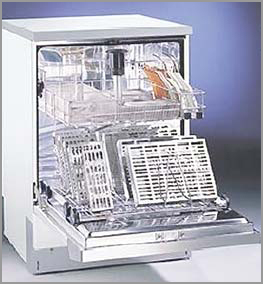 It should be noted that if you think that you may be a candidate for a high-speed autoclave, you should make sure that you choose a dishwasher with a comparable short wash cycle in order to balance your workflow. 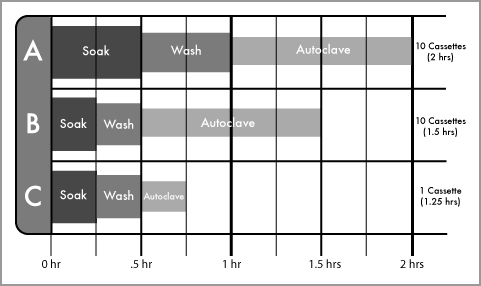 FIGURE 5: Process Cycle Times… slow conventional autoclaving is often faster than the “fast” process method. With process “A”, the first instruments clear the sequence in 2 hours. Subsequently, instruments clear sterilization on an hourly basis. Process “B” will clear the first series of instruments in two hours, but subsequent allotments are still on a 1 hour process time. Only process “C” will reduce actual in-practice workflow; however, if the autoclave capacity is reduced to 1/10th the original capacity, net production time will actually increase. Sterilization does not have to be difficult. It is successfully organized through a diligent work simplification process. Reliability and labor savings should be your primary goals. With this successfully accomplished, speed and ease of use will naturally follow. *Our company and this author neither recommend nor endorse a particular sequence of disinfection or sterilization. This article is intended to simply illustrate choices to be made in the sterilization sequence.